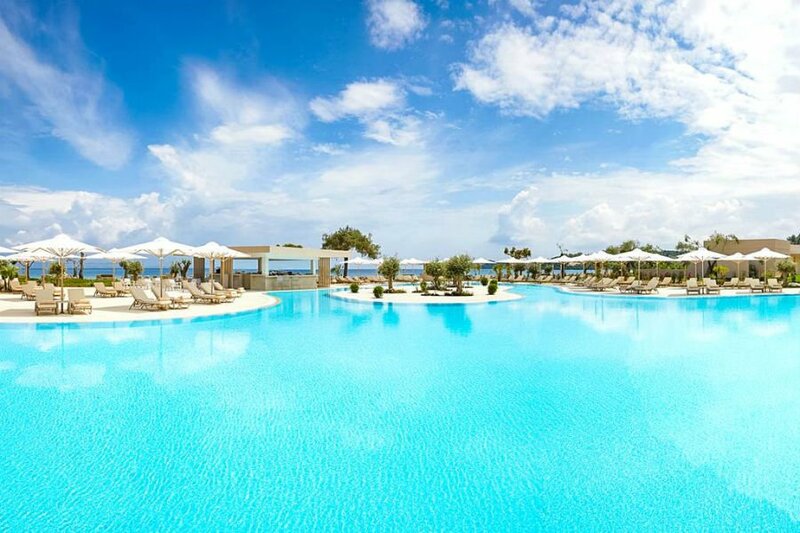 A guide to the best baby and toddler friendly hotels in Corfu including hotels near the beach, with splash parks and with activities for babies and toddlers. 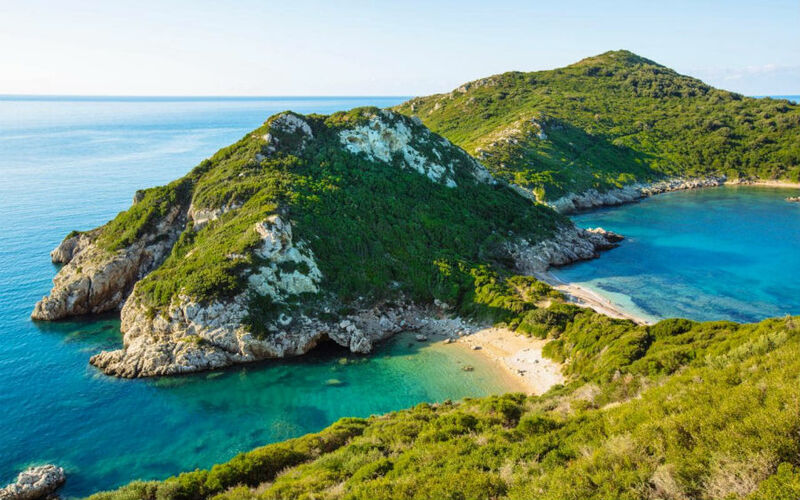 Read on to discover the best places to stay with babies and toddlers in Corfu. The Labranda Sandy Beach is on the beachfront and is a short walk from the resort centre of St George South with its bars and restaurants. There are 4 swimming pools, a playground, stunning gardens and a busy entertainment schedule. The hotel is also close to Agios Georgios Beach which has a blue flag and a beautiful cove with clean, clear water. There are 4 hotel restaurants and an excellent All Inclusive package. 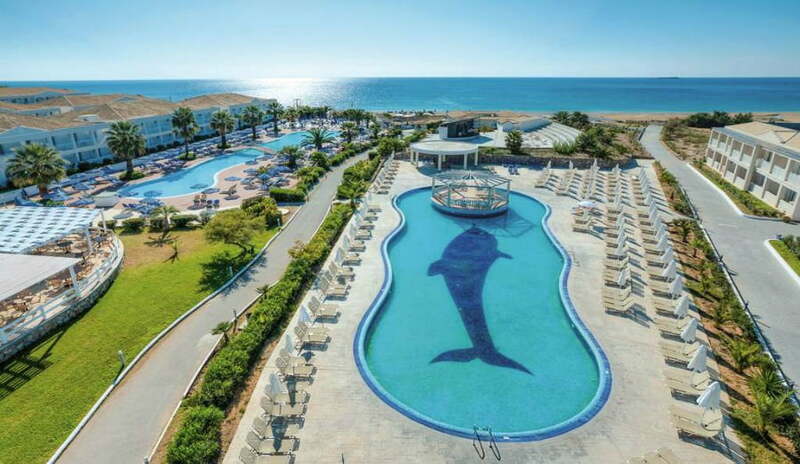 The impressive Roda Beach Resort & Spa is set on the beach just outside the resort of Roda. 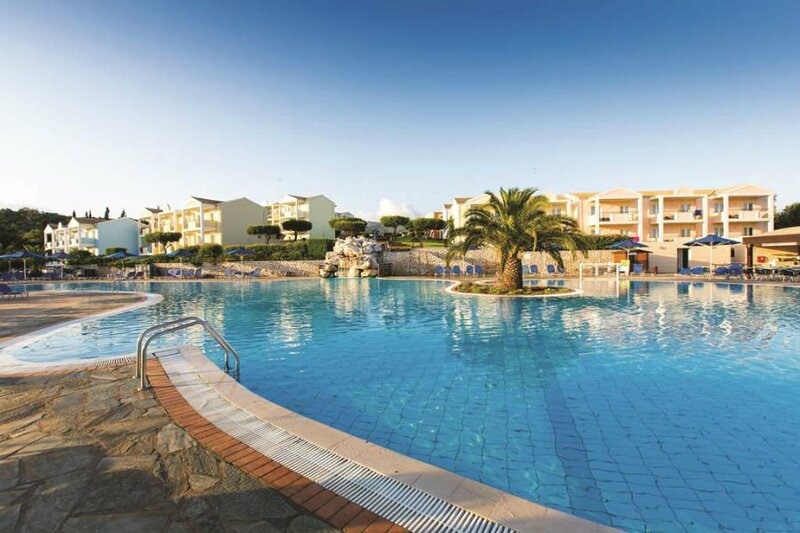 There are 3 outdoor swimming pools with waterslides for little ones, a playground and the beach on its doorstep. Roda Beach has been awarded a Blue Flag and has clear, shallow waters, white sand and lots of snack bars. Family rooms are available and some of them have private pools. All Inclusive is available, and families can eat at one of the 6 restaurants onsite. 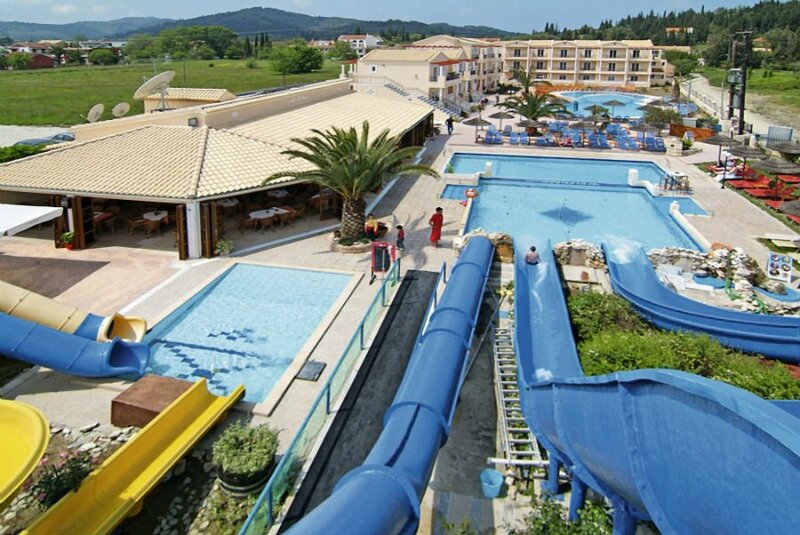 The Sidari Water Park hotel is great for toddlers who love waterslides! There are 6 waterslides at the Sidari Water Park (height restrictions apply), and 3 swimming pools with a separate children’s section. The hotel is also a 10 minute walk to the beach and the town so you can combine days around the pool with beach days too. 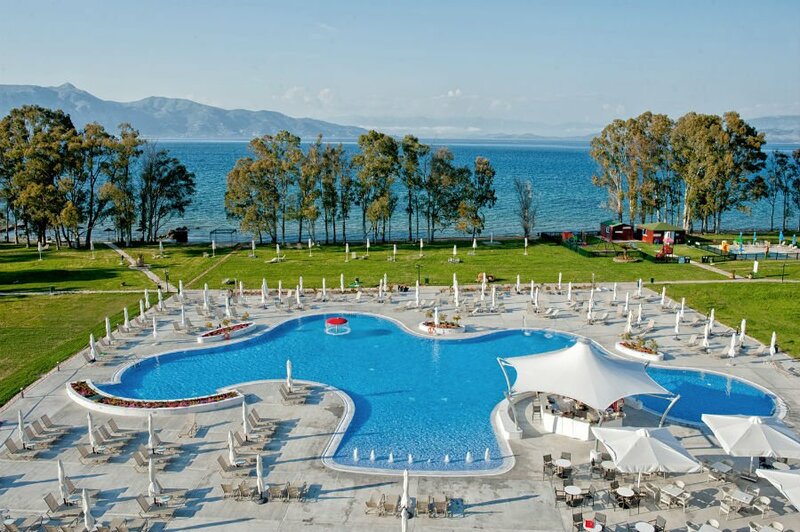 The popular restaurant at the Sidari Water Park hotel serves home made Greek food which is great for families who love good food on holiday. 2 bedroom family rooms are available with a separate bedroom with a double bed, air con, satellite TV and a pool view. 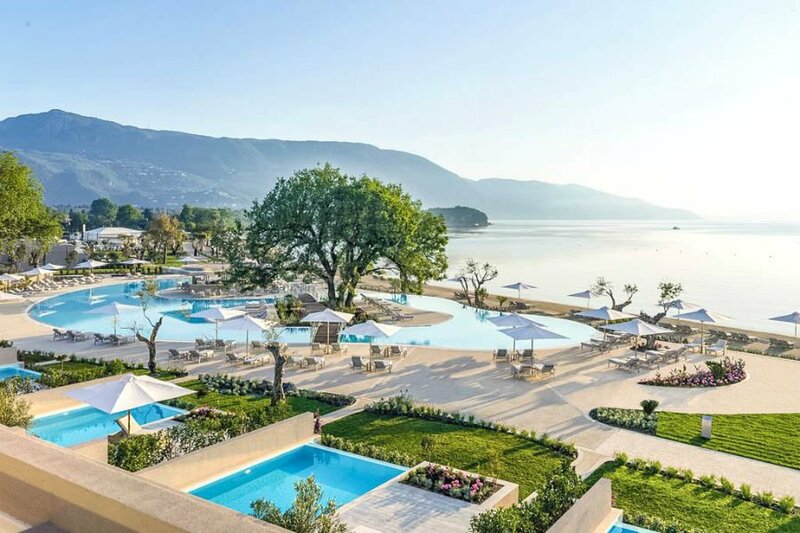 This super impressive luxury 5* resort definitely has the wow factor, and is a great choice for families looking for an amazing hotel in corfu for babies and toddlers! 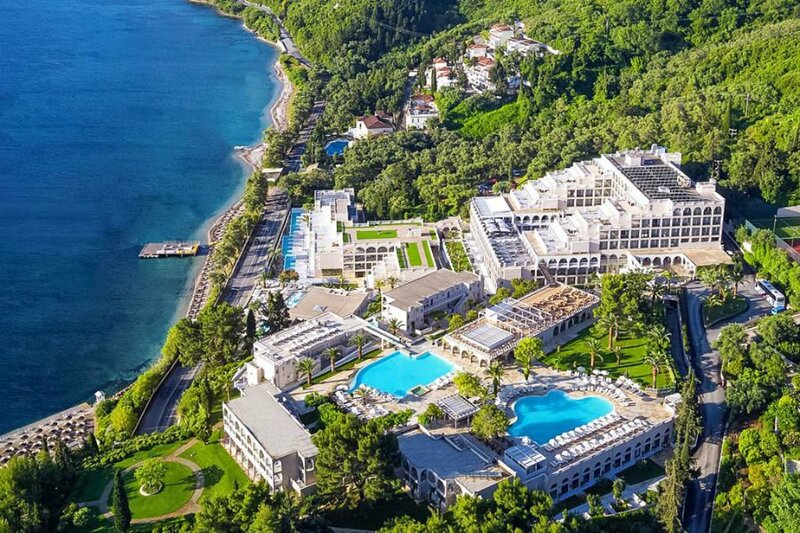 It opened in May 2018 so everything is new and modern, and it is located in a great location on Corfu’s pretty Ionian Coast. There are 4 outdoor swimming pools including a children’s pool and a splash park with water guns and sprinklers. Parents can relax at the Spa while babies and toddlers are cared for at the Heros Creche Club which is available for babies aged 4 months+. This has a soft play area, TV, toys, books and TV and is open between 3rd May – 27th October. Toddlers will love the children’s playground with swings, roundabout, adventure play area and slides. 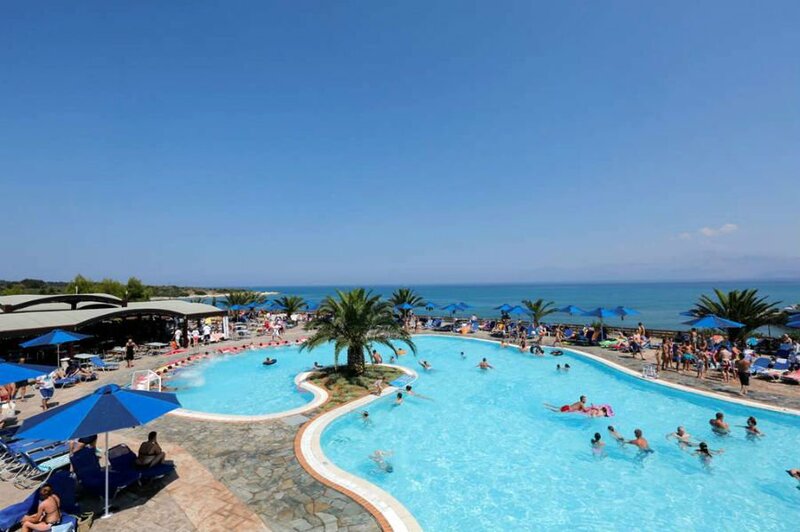 The Ikos Dassia is located right on Dassia Beach which is a 2km long stretch of sand and pebbles with a promenade where you can go on boat trips. All rooms are spacious and stylish -family rooms are available too. The Ikos is just a 40 minute transfer from the airport too. 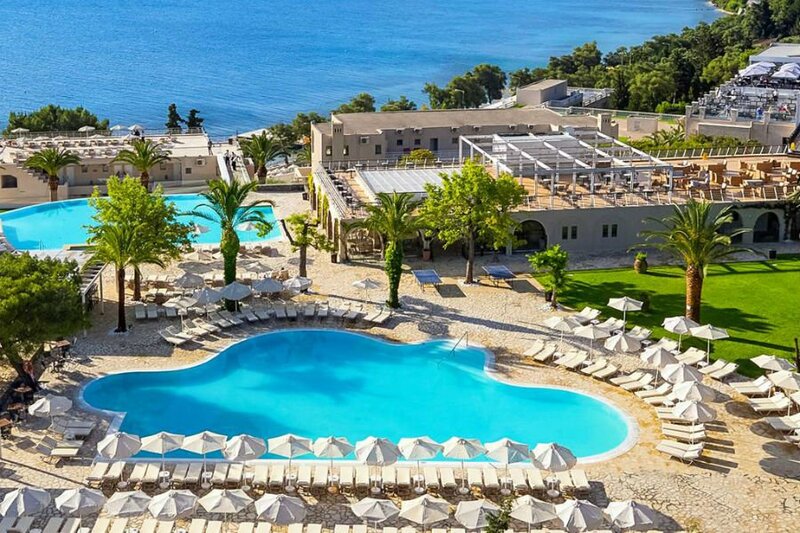 The 5* MarBella Corfu hotel is in great location overlooking Agios Ioannis Peristeron Beach, which is one of the quieter beaches on the island. Popular with locals, this beach has crystal clear waters and sand and shingle to play in – ideal for toddlers! There are 2 children’s swimming pools and a shaded playground with swings, slides and a roundabout. The creche is for children aged 4 months+ so parents can get a bit of me time in the Spa while the little ones are having their own fun. Family rooms and 2 bedroom suites are available. The All Inclusive option is popular with families. 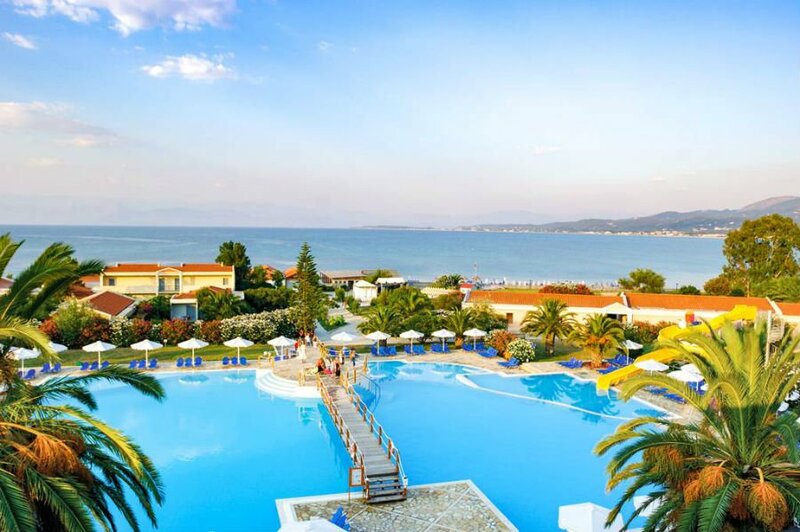 The 4* Mareblue Beach Resort is located in the peaceful resort of Aghios Spyridon overlooking a beautiful sandy beach (accessed by crossing a road). It has recently been refurbished so has a new bar, restaurant and reception area. There are 2 swimming pools including a separate one for children, and a little playground too. There is an indoor soft play area too which is open between April and October. There are loads of leisurely walks to do in the local area including walks along coastal paths and around Lake Antinioti where you can see over to Albania. The resort centre is just 500m away too. Family rooms with bunk beds are available. All Inclusive basis is popular with families too. 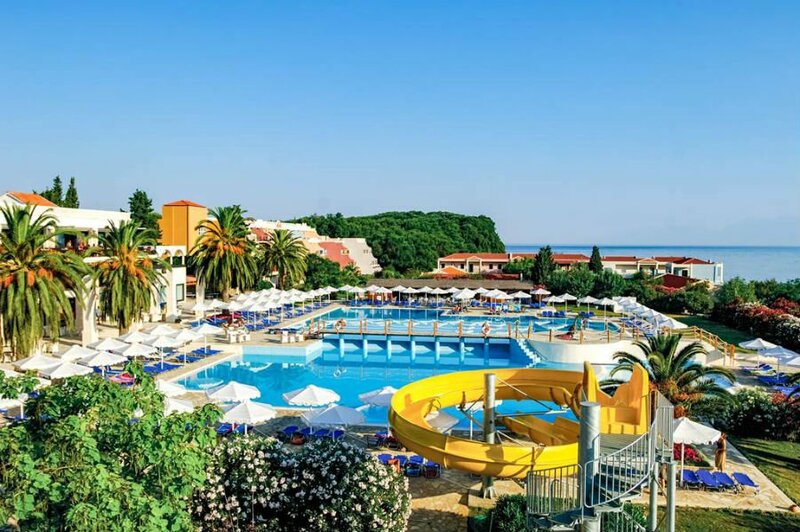 The TUI Family Life Kerkyra Golf hotel is an excellent choice for families looking for a hotel with plenty of activities and facilities for babies and toddlers. It is located in the quiet seaside town of Alykes Potamos on Corfu’s eastern coast and is just a few steps from the shingle beach. 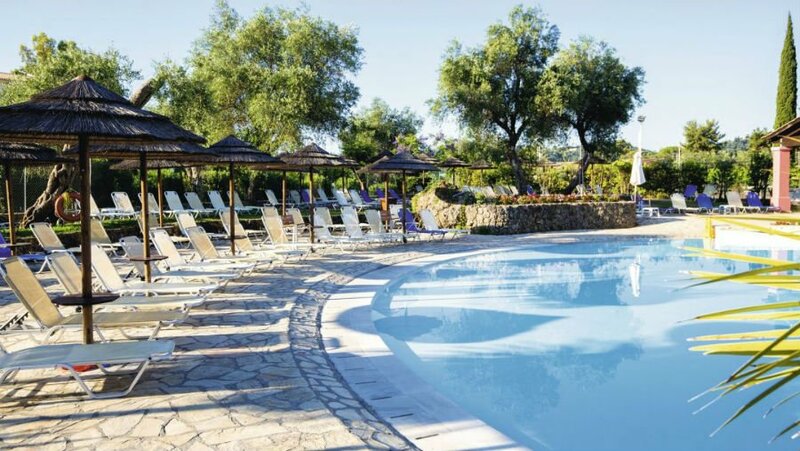 The hotel has spacious gardens so there is plenty of space to run around in, as well as a lagoon style swimming pool and a separate shaded children’s pool. There is a special BabyClub creche for 0-3 year olds which is open 6 days a week and a separate kids club for children aged 3-11. Parents will babies and toddlers really get a helping hand at this hotel – as well as the creche, there is an air conditioned Baby Lounge where you can meet other parents and feed your baby, dedicated parent and toddler activity sessions and baby and toddler equipment hire. Eating is a delight here too, as there are themed buffet nights, an impressive Asian restaurant and evening entertainment. 1 bedroom family rooms are available. This hotel is being totally refurbished for 2019, so it will be looking fresh and modern for guests. Swim up rooms will be added as well, and the pool area will be revamped so it is the focal point outside. The hotel is great for beach lovers – Canal D’Amour beach is just a few minutes’ walk away and the larger beach at Sidari is close too. Best of all the famous, 5 km long belt of sand which runs between Roda to Almiros is just 20 minutes by car. There is also a Spa and a daytime entertainment schedule so you won’t get bored. 2 bedroom family rooms are available. This hotel is right on the beach as just a 5 minute walk from the resort centre of Gouvia with its bars and restaurants. Corfu Town is just a 15 minutes drive away too. There is a lagoon style swimming pool with fountains and waterfalls, and also a separate swimming pool for children. Toddlers will love bopping away at the mini disco and enjoying the evening entertainment. Please note the kids club is for children aged 3+. 1 bedroom family rooms are available. 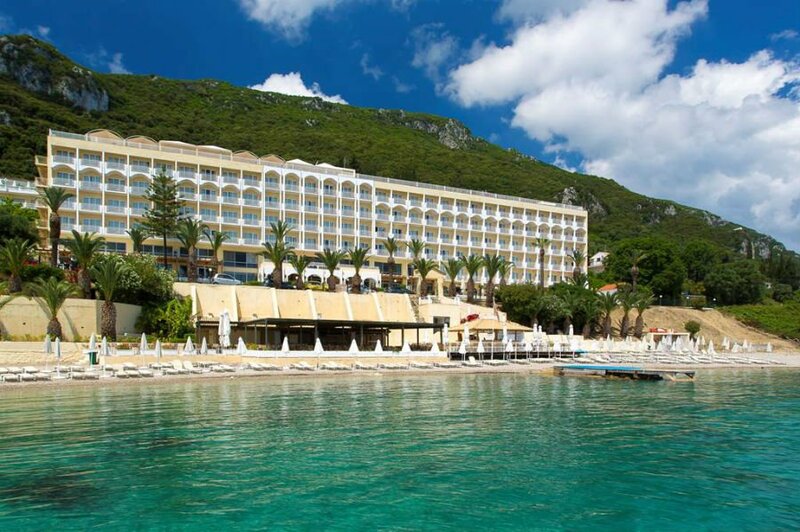 This hotel is a great option for families looking for an all inclusive hotel in Corfu. The hotel is located on a hillside close to the beach with stunning sea views. 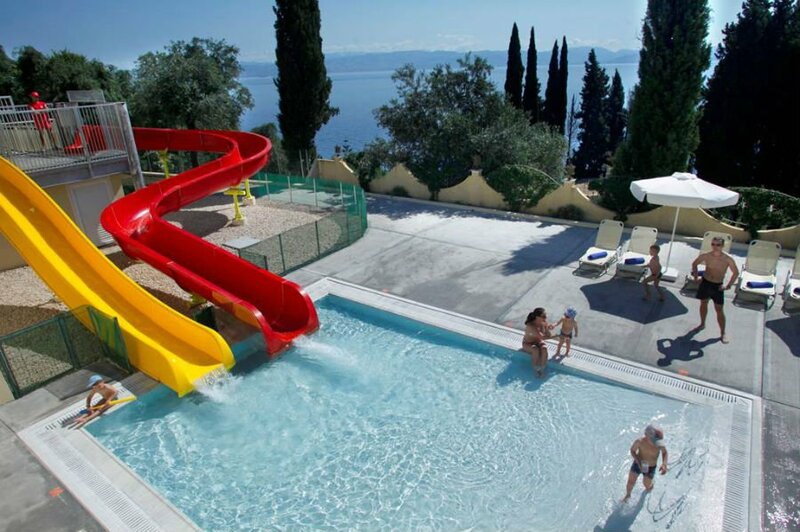 There are 3 outdoor swimming pools including a children’s swimming pool with waterslides. There is also a children’s playground too. Corfu Town is just a 25 minute bus ride away (bus stop outside the hotel). Toddlers will love the unlimited ice cream which is available with the All Inclusive option. They will also love spotting little fish in the crystal clear waters of the sea when they are swimming and splashing around. Family rooms are available. Can you recommend any baby and toddler friendly hotels in Corfu?